The Rainbow Bar & Grill, located in the heart of the Sunset Strip, has been a rock n’ roll institution for decades. Whether you are a rock star or a regular customer, the point is to “party”, and when you hit two o’clock in the morning, its “no-tell motel” time! This is the way it’s been for 46 years. The restaurant was founded by Elmer Valentine, Lou Adler and Mario Maglieri and opened on April 16, 1972, with a party held for Elton John, who had recently made his American debut at the Troubadour two years earlier. Before becoming the Rainbow, the structure had several incarnations. It was the Mermaid Club during the 1930s and The Villa Nova restaurant from 1944 -1968. That is where Marilyn Monroe went on a blind date with Joe DiMaggio. The Villa Nova was owned by Allen Dale and film director Vincente Minnelli who proposed to Judy Garland there. Many believe the Rainbow was named after Garland, as a tribute to “Over the Rainbow, but during the early 1970s, the word “rainbow” signified peace and freedom, so that’s how it received its infamous name, but it’s still an “homage” to Judy. During the 70s and 80s, there were at least 300 people every single night in the parking lot. It was a second home to Lemmy Kilmister of Motörhead, who passed away in 2015. Lemmy loved the Rainbow so much that he moved to West Hollywood to be closer to it. In the last two decades of his life, he was a daily fixture at the Rainbow whenever the band was not on tour, and he was often seen playing the bar’s video poker machine. Following a successful crowdfunding campaign and months of anticipation, a memorial statue in his honor was publicly unveiled in 2016 at his favorite hangout on the back patio. Mikeal Maglieri and Mike Jr. standing next to the Lemmy Kilmister statue. Photo Credit: Alison Martino. In 2017, owner, Mario Maglieri, also known as “The King Of the Sunset Strip” also passed away at age 93, but he was still holding court on the patio until the very end! Today, it’s run by Mario’s son Mikeal, and his grandson, Mike Jr. who conceived the idea of the Lemmy statue. “I loved them both so much and I was with them both on the days they passed” says Mikeal Maglieri. “In Lemmy’s honor, we have renamed the patio, ‘Lemmy’s Lounge’ because of the statue, and we plan on opening them around the world. It’s time to go international! My dad would have wanted that”. The Rainbow became known as a hangout for rock musicians and their groupies during the 1970s. Notable regulars during this period include Alice Cooper, Keith Moon, Micky Dolenz, Ringo Star, John Lennon, Harry Nillson referred to themselves as the “Hollywood Vampires” and they made the Rainbow their home away from home. Everyone from Neil Diamond to Elvis Presley could be seen at the Rainbow. 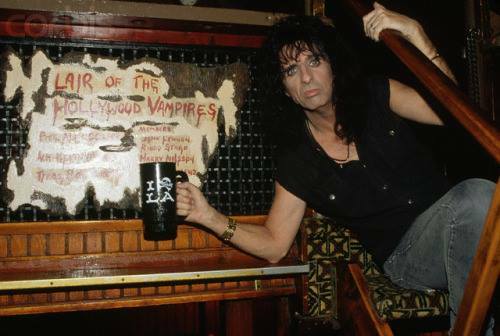 Alice Cooper at the Rainbow. Los Angeles songwriter Warren Zevon references picking up a girl at the Rainbow in the last verse of his 1976 song “Poor Pitiful Me”. The track “Rainbow Bar & Grill” from the Cheech & Chong album, “Let’s Make a New Dope Deal” takes places inside, and eccentric producer Kim Fowley formed the all-girl group “The Runaways” in the parking lot and Guns N Roses filmed part of there video, “November Rain” here. As musical trends on the Strip changed towards heavy metal in the 1980s, the Rainbow followed suit and was mentioned in a lot of their songs such as “Sunset and Babylon” by W.A.S.P.,and “Vampire” by L.A. Guns. This is when C.C. DeVille of Posion and Mötley Crüe ruled the place and their photos still adorn the walls. “We started putting memorabilia on the walls from the get-go. Later we started taking snapshots at the front door, and we’d hang them on the walls. There are layers after layers of photos. The Sunset Strip is where people got noticed. They weren’t going to get noticed in Silver Lake or out at the beach or in Orange County. If you weren’t playing the Whisky, Gazzari’s, or the Troubadour, then you were hanging at the Rainbow. Just last night Slash was sitting here, and Ozzy was here four hours ago,” says Maglieri. Alison Martino of Vintage Los Angeles pays tribute to the Rainbow Bar & Grill. Photo by Kimberly Biehl Schmidt. Alison Martino is a writer, television producer, and Los Angeles historian. She founded the Facebook page Vintage Los Angeles in 2010 and is currently a West Hollywood resident. Alison also muses on L.A’s. past and present on Twitter and Instagram.